Delhi may not be the gourmet capital of India but, with international chains and new concept restaurants testing the city's belly, it's slowly getting there. If you love drama, why complain if your meal comes with some histrionics too? Challenging the notion that Japanese meals are meant to be a quiet affair, the highlight of Benihana in Nehru Place is a live teppanyaki grill at your table - complete with a chef displaying his knife-juggling skills while interacting with customers. If you have kids with you, be assured that they will come away thrilled! Benihana, meaning red flower, has a flagship restaurant in Tokyo and over 100 franchises across the world - including one in India. 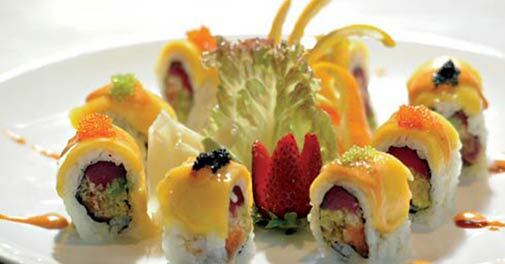 Tucked away in a corner of the busy Epicuria food court in Nehru Place, the restaurant boasts of unpretentious Japanese food served by well-trained attendants. The sashimi appetiser - a combination of salmon, tuna and snapper - is a good starting point before you move on to the well-crafted sushi rolls. Try the emperor roll, comprising salmon, tuna and tempura flakes topped with tobiko and house sauces, or (if you are a vegetarian) the trio seasons roll, which has crunchy asparagus, cream cheese, cucumber and carrots topped with wasabi mayo. All the sushi we tried were true to their origin; the flavours were subtle and clean. The tuna tataki here is also delicious, with slivers of tuna served with a generous portion of ponzu vinaigrette. Typical fare aside, most people head to Benihana for the set hibachi meals available at both lunch and dinner. This meal comes with onion soup, a house salad served with an aromatic ginger dressing, seasonal vegetables and steamed rice. Pick your meat, seafood, vegetables and sauces, and watch a chef prepare it with style on the teppanyaki located at your table. 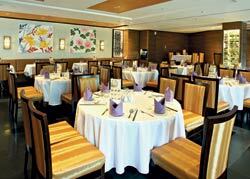 The menu also sports specialty hibachi dinners, including a fresh prawn starter and imported lamb options. 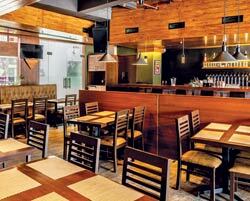 The lounge at Behinana offers happy hours between 3 and 8 pm, where you can get a drink free for each one bought. The cocktails are well executed, with exciting names like dancing geisha, samurai punch and lycheetini. They also have a fine range of finger food to choose from, if you feel like a nibble. However, keep in mind that the decor at Benihana is understated, and it doesn't believe in localising its cuisine either. Head here only if you crave a taste of Japan. Crystal Jade is as authentic as it gets. Here, nobody messes around with flavours to suit specific palates, and the food is just the way it should be. 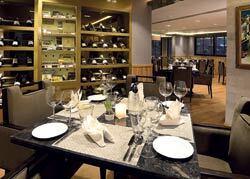 The interiors of the restaurant, where brown and gold merge with black to provide a rather sophisticated setting, seems to follow the same rule. Neither loud nor subtle; just right! You must try the multi-flavoured Xiao Long Bao dimsums here - a specialty, they are colourful, and range from vegetarian to chicken and pork. If you're a pork lover, you can't afford to skip the baked honey BBQ pork pastry. The Peking roast duck comes in two portions - one served like a roll with lemongrass, and the other cooked as part of the main course. While the roll works wonderfully, its cooked variant disappoints. Vegetarians may try the deep fried crispy lotus slices - it does make for a pretty good snack. My main course here included sautÃ©ed prawns in spicy sauce, diced chicken with dried chilli and cashewnut, and the second part of the Peking roast duck. The prawns emerged the winner, followed very closely by the rice. For dessert, head straight for the delicious baked coconut tart! Modelled after an all-American steakhouse, complete with a Harley Davidson motorcycle in the window and 80's music playing on the jukebox, Porterhaus at Saket's DLF South Court Mall puts you at ease almost instantly. Our evening took off with a cocktail called old fashioned and The Animals crooning House of the Rising Sun in the backdrop. The drink was just the way it should be - razor-sharp sweet and orange-rind fresh with just a hint of nostalgia - perfectly complementing the haus nachos it was served with. Next came an orange mojito, served with Jack Daniel lamb skewers. Doused in sauce, the tender chunks of meat were light but potent enough to balance the mocktail's citric punch. The roasted beetroot salad could have been tastier, though. For mains, I ordered a porterhouse steak, served rare, with a side order of mashed potatoes. Thankfully, they made it exactly like I wanted it - lightly grilled and juicy with a perfectly pink centre, generously covered in red wine sauce. Need I say that it hit the spot just right? Have this one with a lime-spiked Corona and, believe us, it will make for an evening you won't regret. There are two things you need while visiting The Hiatus at Qutab - a few hours of stolen time and a palate willing to experiment. Replete with an enchanting patio and an enviable wine cellar, the restaurant melds luxurious and laidback in a cocoon of warm hospitality. The evening took off beautifully with a couple of perfectly rendered cocktails, in the form of a bloody mary and mango anise tini. Following closely on its heels was a concoction of hearty flavours, the pumpkin and smoked chicken soup, which paired beautifully with the cheddar crouton. The main course of bacon wrapped chicken in paprika-infused makhni gravy with saffron pilaf is a must-try. The dish - which melds Indian and Spanish cooking with artistic ease - encases a centre of Manchego cheese, sundried tomatoes and wild mushroom, served with a side of honey glazed vegetables. The cherry on top? Well, there's nothing like a refreshing lemongrass kulfi with raspberry jelly to bring the curtains down on a gastronomic experience for the gods. Imaginatively transcending our acquired familiarity with red, green and yellow Thai curry, Dimcha and Dao promises Oriental authenticity with a plethora of herb and seafood-based dishes. Look at its interiors, and you know that the exoticism doesn't end there. 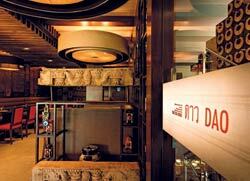 Light plays on the architectural elements of the split-level restaurant, done up in earthy hues of brown and red, filtering through intricate Asian lattice work. We ordered the prawn tom yum soup and its tangy notes were a delightful departure from the usual heavily soy-flavoured concoctions. Of the dumplings sampled, the Szechuan pepper chicken encased in a pok choy leaf was a veritable explosion of flavours. Succulent and fragrant, it had pungent undertones of pok choy beautifully balanced out with slow-cooked chicken. The crispy prawn chunwan was a lightly sweetened rendition crusted over with pepper. Be sure to try the shredded chicken in basil sauce and stir fried chicken with cashew and spring onions for fresh, nutty flavours. The Thai fish curry, however, is a tad too sweet - and could do with some tempering. The coconut ice cream with crumb topping was a fitting end to the meal.